Not because you spoke expletives and your mother made you, but because it’s way more effective than fluoridated toothpaste for getting your smile sparkly white. For the record, my mom did make me brush my teeth with a bar of soap when I was a kid. I had told my younger sister to “Shut up”, and that was unacceptable. Of course, I was drama queen and made it out like I was gonna choke and die. Aside from the awful taste, bar soap in my mouth didn’t scar me for life, because here I am using Tooth soap of my own accord. Tooth soap, unlike bar soap, tastes pretty good (spearminty fresh, to be specific). Unlike tooth paste, tooth soap only requires a small amount, and then it will suds up as you brush. As much as I tried to be conservative with the amount of toothpaste usage, I always ended up dropping some in the sink while brushing. So, I had to use twice as much as I intended. Using a few drops of liquid tooth soap on my brush or chomping a tooth soap shred is way easier to prevent waste and keep from dribbling out of my mouth while brushing. But, there are far greater reasons than economics to use tooth soap instead of tooth paste: health, hygiene, and sparkly white teeth. You can read my research post on how excess fluoridation leads to dental caries and various illnesses (including cancer). If you’re already savvy on the fluoride issue, and you’re looking for tooth cleaning alternatives that actually work (and you’re really not into the baking soda thing), then check out tooth soap. It’s safe for pregnant women and children. You can even use it with babies who have a lot of chompers. 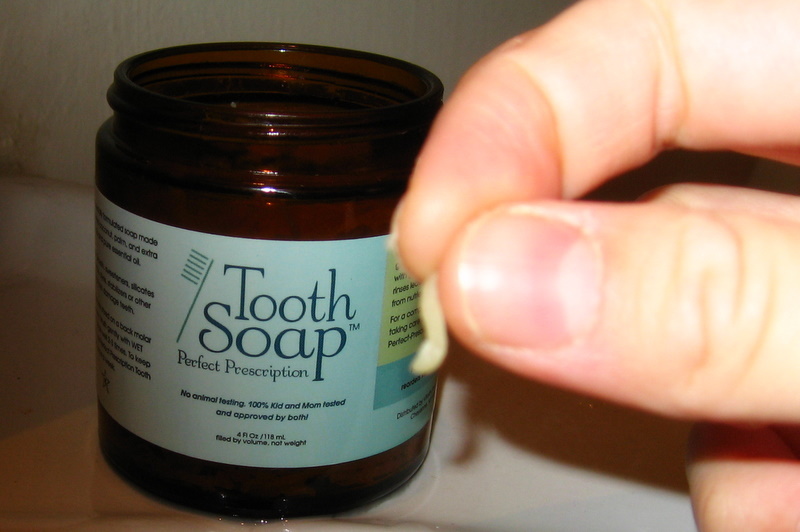 Tooth soap works by cleaning the teeth and allowing food to re-mineralize. Dental caries occurs when calcium and phosphate ions leave the teeth faster than they can be replenished. The key is to replenish or re-mineralize the teeth through food and nutrition, but to clean off any residue or barrier that prevents the re-mineralization. Regular tooth pastes (even many of the brands in the health foods stores) either have fluoride (which includes a warning that children under age 6 shouldn’t use it since excessive fluoride ingestion has led to serious side effects, including death) OR they have glycerin. Glycerin coats the teeth and prevents the re-mineralization process from occurring, and it traps in sugar which breaks down the calcium and phosphate ions. Tooth Soap ingredients: specially formulated soap made from saponified coconut, palm, organic extra virgin olive oils, filtered water and pure essential oil. There is NO added glycerin, sweeteners, silicates (sand), fluoride, dyes, stabilizers or other materials that can damage teeth. Interested in learning more about how toothsoap works? Read more FAQs from Vitality Products. Research on tooth remineralization began as early as the 1930s…earlier than the published research on water fluoridation in the 1940s which has been questioned in scientific literature as to whether it is truly beneficial and necessary. I love the liquid, but the shreds work well, too. Since you only need 1 tooth shred per brushing, the shreds definitely seem to last longer and are more economical. I think the shreds would be easier for people who often travel via airlines: easier to pack and transport and easier to get through the security screeners. My husband and I share the liquid tooth soap and the tooth shreds. At the rate we use it (two people brushing 2 to 3 times per day), it’ll be a full year before we’ve used up the contents of both. Do babies need tooth soap? I’m not sure if my son, 11 months old, needs to use tooth soap daily for brushing his 8 teeth. But, I don’t think it’s harmful to him. In fact, using damp gauze with 1 drop of liquid tooth soap and rubbing it on his teeth and gums is helpful while he’s teething. He can definitely use the extra calcium, and when drinking water or breast milk don’t quite rinse the food off his teeth, gauze and tooth soap do the trick. After using the tooth soap on my son, I use a second piece of gauze with only water to help “rinse” and “wash-off” the tooth soap. As he grows into toddlerhood and brushing his teeth becomes part of his bedtime routine, I don’t plan on using anything other than pure soap and water to help him clean his teeth and avoid damaging the enamel. 2 fluid ounces of liquid tooth soap and 4 fluid ounces of tooth sheds retail for $24.95. Available flavors are peppermint, spearmint, cinnamon, ginger, and citrus, and plain jane (flavor-free). The Tooth Brightener by Perfect Prescription helped me naturally begin to regain bright, white teeth. After a less than effective tooth cleaning and cavity repair in March, I was surprised and disappointed that my teeth absorbed stains from herbal teas and food at a rather alarming rate. Two months later, you couldn’t tell that I had recently been to the dentist. By mid-summer, I started using Tooth Brightener once a week, and I began to notice a difference after a few weeks. I’ve also noticed that my teeth are less sensitive. Tooth Brightener uses calcium and magnesium (whole food ions that your body and teeth need for repair and re-mineralization). It also uses sodium bicarbonate. When used in conjunction with Tooth Soap, Tooth Brightener is extremely effective at removing oils and stains and allowing your teeth to rebuild naturally. Tooth Brightener is a fine powder that comes in a 0.5 ounce jar, and it retails for $17.95. You only need a little sprinkle on your brush once per week. One jar could very easily last two people 6 – 8 months, if not longer. Did you eat a little too much garlic and you don’t want to offend anyone with your dragon breath? Personally, I’ve found very few things that can conquer garlic breath effectively and in a hurry. Never fear garlic-lovers, because Perfect Prescription also came up with a whole food-based product that leaves your mouth feeling clean and fresh after meals and between brushings: Tooth Swish. It neutralizes acids, promotes salivation, and re-mineralization. Tooth Swish stimulates the gums, regulates pH, and freshens breath. Tooth Swish ingredients include original Himalayan crystal salt, bicarb of soda, whole food calcium & magnesium, and essential oils. Only a small amount is needed for effective use: just tap a small amount into your mouth and you’ll instantly notice the salivation begin. I tried the energizing peppermint. Salt and peppermint create a very strange, yet unoffensive, and somewhat enjoyable taste in your mouth. Swish, swish, swish, then spit it out. No need to rinse. This is a GREAT thing to keep in your purse or diaper bag. Forget breath mints with those sugars or excitotoxin sweeteners. Instead, use something that’s safe and healthy that won’t leave you thirsty or wishing you had more breath mints. 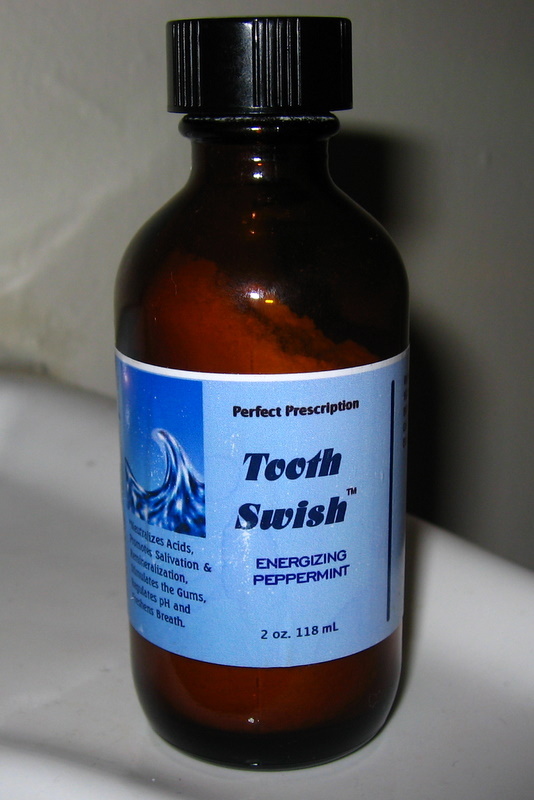 Tooth Swish is available in a 2 oz. bottle which could easily last 1 person 8 to 12 months. It retails for $24.95 and it’s available in peppermint, lemony lime, and spearmint. how funny, i just bought this stuff for the first time a few months ago. due to the sticker shock, i only bought a bottle for the kids (i use dr. bronner’s bar soap…blech. not unbearable but not delicious for sure). i got the mixed fruit with honey flavor. Grace never noticed a change i don’t think (she’s 2), Asher doesn’t like it, but puts up with it w/o a tantrum at least. I only have to use 2-3 drops for them. I’ve used it a time or two, and feel like i have to use a lot to feel like it’s in there…but i’ve heard the flakes are much more sudsy (i.e. better for adults). Yeah, I started using a different brand of tooth shreds. Rose of sharon Acres I think its called. While it does taste nasty in the beginning I’ve gotten used to it . I do like the way it works. The only downfall I have found in using the shreds is that they fly off a motorized toothbrush. And so I gently hold them in between my front teeth. I hope to get the liquid stuff in the future and get all of the kids on them soon! 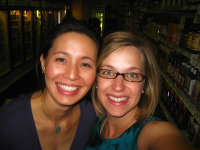 Awesome posts on fluoride and tooth soap! It was very informative. I have been using floride free tooth paste for maybe 2 yrs now, usually get toms or jason floride free but I’m interested in the glycerin thing. When I get back from Vegas I’m going to check that out. I use a dentist that uses floride free products too! I just went a few weeks ago and foudn I had several cavities and I’ve NEVER had one in my life! I was bumbed but the dentist said it’s common with pregnancy. My gut told me that maybe there was something else to this. So I’m going to check on the glycerin. I hope to check out some of your links when I have a chance too. Thanks for the great postes! Well, Dolly. thanks a lot. I just dropped $42 on TOOTHEPASTE and whitener. Our whole family has been using regular toothepaste, and my doc even prescribed flouride tablets for the kids since our Portland water is not flourinated. Should I stop those? My kids call it their “tooth candy.” Hey, if you type in SAVE15 at checkout, you get 15% off, and that saved me the shipping costs!